lol! we had the same discussion this weekend. I was looking for a non-stop flight to Pittsburgh from Detroit and couldn't find one for less than 300$, but smart planning goes this way - I check out flight prices for Baltimore with one stop. I get a ticket for 90$ with a layover at Pittsburgh. Just check out at PHL and I save 200$. Sorry about that I travel economy! There is always a smart way of travelling! I and my friends were analyzing these cost factors and one significant reasons that we found was that passengers pay less as they waste their time on a lay-over, while airlines sell cheaper as some part of their maintenance on two fights is taken at the same time. My first real job out of school was in Pricing/Yield Management at American Airlines. Price is demand-based, as opposed to cost-plus. Thus there are dozens of ways that you can game the system-- back-to-back (booking a series of roundtrips so that you can pair them to look like there is a Saturday night overstay) or hidden cities ("missing" the connection, since it's cheaper to "miss" the connection to Oklahoma City, rather than buy the ticket to Dallas). You can even buy your back-to-backs across multiple airlines, making it harder to catch. The list goes on. Shouldn't the airlines not care? 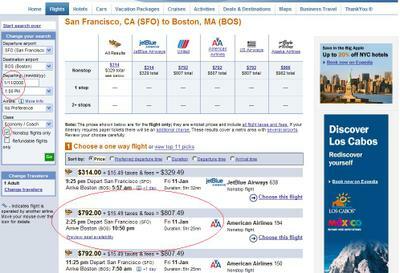 Why does a flight from NYC to Vancouver cost $179, while a 40 minute SFO to LAX flight can be $700? 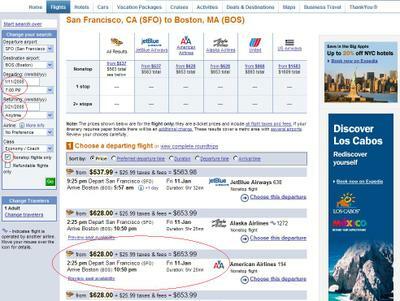 Airlines have to price discriminate to get the folks who actually would pay more to do so. So the current rules are artificial fences that approximately distinguish business versus leisure travel. You can't just ask someone if they're business or leisure-- else, they'd have the incentive to lie. So what's the solution? In other words, how can airlines price seats such that people pay the "appropriate" price and that there is market efficiency? Easy, make airline seats a tradeable commodity. Allow resale on an exchange, just like corn and oil futures. That eliminates spoilage. Plus, it takes the pricing decision out of the hands of the airline. Thus, airlines are reduced to 2 decisions-- how many seats to release and when. But not price-- let the market determine that. You want a seat? Just go to the one exchange, select the flight, and you're done. So why isn't that solution implemented? After all, we wouldn't have to buy tickets in advance or play silly pricing games-- and greater efficiency means we all could travel more cheaply and often (no need to plan). The unions have an agreement with the airlines here. When Crandall broke the Christmas strike at American over a dozen years ago, he was able to do so by threatening to change that provision. The effect would be to commoditize the industry and also eliminate the huge sunk cost that airlines have invested in their yield management systems. AA alone has almost 300 folks in PYM (pricing and yield management). A final pricing fallacy for you-- many believe that business travelers subsidize the leisure travelers. After all, they are paying 3 to 4 times the fare, right? Wrong. What's important to a business traveler is schedule. If the meeting runs late or early, he wants to know there are 5 or 6 other direct flights that day within an hour of each other. At DFW, we had a dozen direct flights to LAX each day, compared to other airlines that had only a couple. Hubs concentrate power and frequency and allow the airline to get a disproportionate share of business travel. But if you need to run that schedule to attract the business customer, what if there isn't actually that much demand in that particular market? In such case, you have to heavily discount the fares to maximize revenue on the remaining seats. Note that business markets such as ORD-BOS might be 65% occupancy, while DFW-LAS are booked at 103%. Thank the business traveler for making this possible. Most people think fares are "expensive", yet don't know the true operating costs necessary to make that conclusion. Business travelers drive the current pricing system. Even the low fare airlines have to acknowledge this. These folks pay more and travel more than grandma or her kids, who fly once or twice per year. Crandall said it best-- "The airlines are a lot like church. Many people go, but few understand." The airlines price tickets to extract "maximum economic value" i.e. they want you to pay as much as you are willing to pay. The assumption is that a person who buys a one-way flight is generally less price sensitive than a round-trip flight. They are going on business or on a long trip or moving and hence need to make their flight happen. Thus they charge more. Smart money will buy the round trip of course. Also web sites like Kayak that help you find the best rate are screwing with this system because it makes it harder for airlines to leverage the imbalance of information to get you.